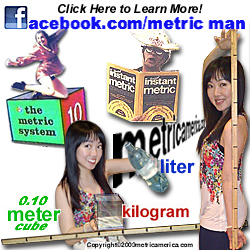 There are other metric information sites with all sorts of calculators and gadgets. THIS IS JUST A FREE, EASY TO NAVIGATE, METRIC LEARNING SITE FOR EVERYDAY PEOPLE WHO HAVE THE DESIRE TO LEARN BUT DON'T HAVE THE TIME. all other units are derived from them. BASE UNITS of measurement are defined in terms of the meter for length and kilogram for mass. The ampere is defined as that current that, if maintained in each of two long parallel wires separated by one meter in free space, would produce a force between the two wires (due to their magnetic fields) of 2 x 10-7 N (Newton) for each meter of length. (a Newton is the unit of force that when applied to one kilogram mass would experience an acceleration of one meter per second, per second). The candela is defined as the luminous intensity of 1/600,000 of a square meter of a cavity at the temperature of freezing platinum (2,042 K). Base Units "meter" and "kilogram"
For more than a century the world's fundamental unit of mass has been based on a single, cylindrical piece of metal. And authorized copies of it stored in secured chambers around the world including the United States, over the years in infinitesimal ways, are shedding or accumulating atoms here and there, thus throwing off the accuracy of the objects meant to be the world standard for measurements of mass. The 4 cm tall ingot of platinum and iridium, known as the International Prototype Kilogram, offered the world a standardized way of measuring what earlier scientists defined as 1 kilogram being the mass of 1 liter of distilled water (at sea level). But to ensure greater accuracy there is a method of nano-measurement using "Watt Balance" housed at the U.S. National Institute for Standards and Technology (NIST) near Washington, DC, which is a bid to recast the kilogram as a mathematical equation, unerring, immutable and ultimately easy for experts to reproduce. And it is expected to yield groundbreaking calculations. The ultimate purpose of the "Watt Balance" is to help scientists generate a reliable calculation of Planck's Constant. A universal value that quantifies the relationship between energy, light and an object's mass, which in turn will produce a new, more accurate basis for defining the kilogram worldwide. 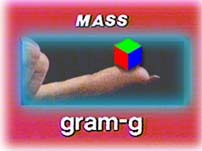 The race to reinvent the unit of measurement was considered important, partly because the kilogram is the only holdout in the metric system still based on a physical object rather than a formula derived from a universal constant. The meter, once pegged to the length of a bar of platinum, was redefined in 1983 by a formula using the speed of light as the distance light travels in a vacuum over 1/299,792,458 of a second. Which means that the length of a meter will never change. In July of 2012, scientists at the world's biggest atom smasher in Switzerland claimed the discovery of a new subatomic particle. They called it "consistent" with the long-sought Higgs boson, popularly known as the "God particle" that helps explain what gives all matter in the universe size and shape. It also adds to the "Big Bang" theory in creation of the universe. The Higgs boson, which until now has been a theoretical particle, is seen as the key to understanding why matter has mass, which combines with gravity to give an object weight. Very similar to the idea of gravity as Isaac Newton discovered it to be where gravity was there all the time before Newton explained it.